We’re big fans of BioLite, the New York-based startup turning fire into electricity. What? That’s right, BioLite stoves, as well as being handy for cooking and heating, double as a mains-free power source, for charging lights, phones and tablets via USB. They’re reasonably priced, as well, and if there’s an opportunity to reduce reliance on fossil fuels, we’ll always support it. So the BaseCamp is actually more of a barbecue than a stove, but it is powered by wood and other biomasse. The sizeable grill is big enough to cook food for several people, and the heat generated also powers a USB electricity cell on the side. The BaseCamp stove comes with a flexible LED light, which plugs directly into the USB port. The grill is wide enough to cook food for several people, and the heat is evenly distributed. 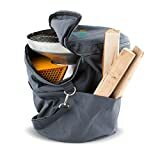 At close to 5kg, the BioLite BaseCamp USB Cooker with FlexLight isn’t for backpacking, but it’s easy enough to transport from the car to the campsite without too much trouble. 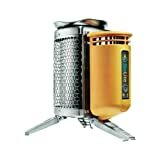 Stainless steel is the order of the day with the BioLite BaseCamp USB Cooker with FlexLight. Strong, sturdy and resilient, this super stove is in no way a novelty. One of BioLite’s most powerful burners, 30 minutes of burning buys you roughly 5 hours of talk time on a mobile phone, 5 hours of video, or 20 hours of audio. The burner itself is located at the bottom of the stove, and accepts all kinds of biomass, although wood is best. Simply feed your wood into the BaseCamp, and the heat rises up directly under the grill unit. No waste, just straight up heat, with the excess being used to charge the cell. Supplied with the cell and a FlexLight, which plugs in, stands up stiff, and can be moved around easily. The BioLite BaseCamp runs on biomass fuel, which means wood and anything else eco-friendly that you can burn, to avoid using fossil fuels. Strong, sturdy and resilient, this super stove is in no way a novelty.